On July 15th, 1958 15 acoustic or acoustic-electric models were introduced into the Rickenbacker line. 1958 was a great year for Rickenbacker; already 28 years old since our first electric went to market, something new was in the wind. On July 15th, 1958 no less than 15 new acoustic or acoustic-electric models were introduced into the already burgeoning Rickenbacker guitar line. Ranging from a list price of $379.50 to $874.50, just about every combination of binding, inlay, pickup, or vibrato was available. Crafted of the finest Spruce, Maple, and Mahogany, these instruments are today some of the rarest and most highly sought after classics in the vintage market. 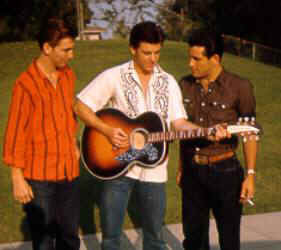 Rick Nelson (standing with James Burton and James Kirkland), was often seen on the "Ozzie and Harriet" TV show playing his Rickenbacker 380 acoustic guitar. 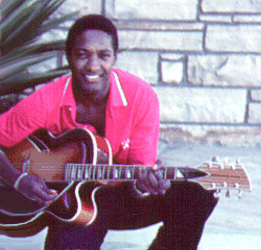 Sam Cooke plays his Rickenbacker Model 390.